This blog is a place to discuss the planning, construction, failure, and rebuilding of the first American lighthouse erected at the Mouth of the Mississippi River. In 1804, President Thomas Jefferson, having recently purchased the Louisiana Territory, envisioned a grand monument to serve as a navigational beacon to mark the entrance of the mighty Mississippi River. Benjamin Henry Latrobe, the renowned architect and engineer, was selected to design such a lighthouse. On paper, Latrobe’s “Lighthouse at the Mouth of the Mississippi River” was magnificent! 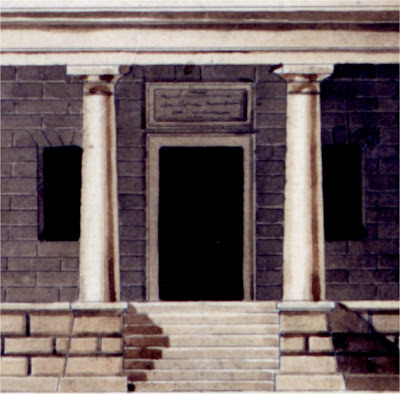 The building materials consisted of brick, marble, and other stone; but the foundation of this heavy structure would have to be laid upon the soft clay that lines the entrances of the Mississippi River. The site chosen for the lighthouse was a small island located north of the Northeast Pass of the Mississippi River called Frank’s Island. Although engineers determined the soil of the island to be adequate for the structure, no contractor at the time was willing to undertake such a foreboding task. After some prodding, the designer of American lighthouse reflector systems of the day, Winslow Lewis, finally accepted the challenge; but only under certain contractual terms – Congress agreed that he would be paid in full should the structure’s foundation fail. Finally, in 1818, construction on the lighthouse began. In March of 1820, just days before the lighthouse was to be completed, the foundation settled and cracks began to form throughout the structure. The internal arches could no longer support the massive weight of the stone parapet. The columns fell to the ground and the walls of the Keepers Quarters collapsed. Without any support at its base, the lighthouse tower began to list. Deemed too costly to repair, the lackluster remains of what was to have been a magnificent structure were abandoned. 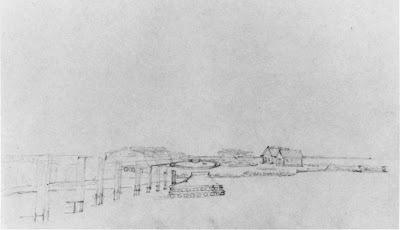 Concept drawing of Winslow Lewis' lighthouse by author using scale drawing of tower by Samuel Wilson, Jr. The Cajun Coast Welcome and Interpretative Center in Morgan City is in danger of immediate collapse after early reports from the scene indicate its 75-foot pilings may have given way this morning. The building had sunk approximately 6 feet by press time. Personnel and media on the scene were moved back because of a concern that, if the building did collapse, they might be struck by glass. Officers who approached the building indicated they could still hear it creaking. Workers notified CCVCB Executive Director Carrie Stansbury around 8:30 a.m. today that there was a problem with the building. Morgan City Police and Fire departments were notified around 9:50 a.m.
“They have no idea what happened,” Stansbury said. Representatives from every aspect of the building’s planning or building phase were on their way to the interpretative center and expected around press time. The building appears to be sinking in the middle, and photos show water lilies at a level higher than the front door. Stansbury said the building was scheduled to be completed July 15. The parking lot was a separate project and was due to be completed by the end of the year. She and other local officials had just completed a walk-through of the building Tuesday. “It is very heart-wrenching to see what is happening to the building right now,” she said. The building on Martin Luther King Jr. Boulevard was funded with $1.125 million in state money and more than $2 million in local match. Aegis Construction Inc. of LaPlace is the contractor with Washer Hill Lipscomb Cabanis Architects of Baton Rouge designing the project. I just found out that a piece of Frank's Island Lighthouse history was up for auction last month. A leather bound ledger book containing the signature of Benjamin Beal, one of Winslow Lewis' sub-contractors, was put up for auction by a New Orleans-based auction house. The contents of this ledger contained lists of workers, organized by month, from April 1818 to April 1823, indicating the days worked per month for each worker. As a ledger, this book does not seem to contain any significantly historal information, such as a description of the first lighthouse's collapse or a drawing of the second lighthouse. There are, however, some interesting nuggets of information listed in the auction description that give a glimpse into life on Frank's Island while the lighthouses were being constructed. Frank Island Lighthouse*, An Account of the Time Building the Light House on Frank Island, New Orleans, ledger with watermarked, laid paper, three quarter leather boards, manuscript entries, one month per page, covering the period from March 1, 1818 through April 17, 1823, the front paste down signed "Benjamin Beal, Hingham, 1818", each page noting the days worked by each worker, with various notes scattered throughout including; "cutting wood up the river", "stole a boat and absconded". *Notice it is referred to as "Frank Island" in Beal's ledger. Most journeys begin with a destination in mind. On this journey, the destination was unclear. In this case, there were two lighthouses – one that was short-lived and one that had recently collapsed. Their location was, at one time, known as Frank’s Island, Louisiana – located at the Northeast Pass of the Mississippi River. Today, nothing remains of Frank’s Island. The island has been consumed by erosion and is now totally engulfed by a body of water called Blind Bay. Many people are aware of the history behind the Frank’s Island Lighthouses. President Thomas Jefferson ordered Congress to establish a navigational beacon to mark the entrance to the Mississippi River. The lighthouse that Jefferson had in mind was no ordinary lighthouse. He wanted a monument to show the world that the Louisiana Territory no longer belonged to the French. To design such a grand lighthouse, Congress selected renowned architect and engineer, Benjamin Henry Latrobe – the designer of the United States Capitol. Eventually, Frank’s Island was chosen as the location; but a little spat between the United States and England, called the War of 1812, got into the way. Finally, in 1818 Congress authorized construction of the lighthouse and work began. The not-yet-famous lighthouse builder, Winslow Lewis, was awarded the contract to construct the lighthouse. There are questions as to why the “Lighthouse at the Mouth of the Mississippi River” began to settle severely and develop cracks; but the original lighthouse had to be torn down and a new one was erected in its place. The second lighthouse, designed and built by none other than Winslow Lewis, was completed in 1823. At this point, the history of the Frank’s Island Lighthouse becomes vague. There are no known pictures of the structure with a complete lantern room. As other entrances to the Mississippi River became more popular, the Northeast Pass and the Frank’s Island Lighthouse were abandoned in 1856. The journey does not continue again until 1934 when architect and descendant of Latrobe, Samuel Wilson, Jr., inspected the ruins of the Frank’s Island Lighthouse for the Historic American Buildings Survey. As a result of this survey, he composed a written report, took several black and white photographs, and drew a scale drawing of the tower. One of the most intriguing elements of Wilson’s inspection is a photograph of a marble builders marker set into the brickwork of the lighthouse, just above the doorway. 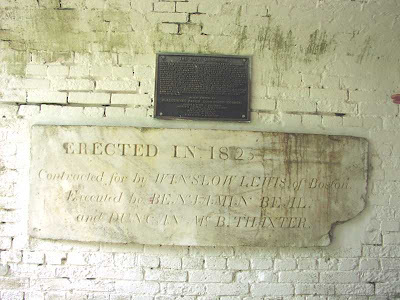 The marker reads, “Erected in 1823, Contracted for by Winslow Lewis of Boston, Executed by Benjamin Beal and Duncan McB. Thaxter.” All three of these gentlemen are credited in the construction of the first lighthouse at Frank’s Island. What really makes this marker stand out is an observation that Samuel Wilson makes in his report. He noted that the date on the marker did not appear to be the original date. Apparently the “3” had been recarved over a “0” making the date 1820 – the year that Latrobe’s lighthouse had been erected. Is it possible that this builders marker from the second lighthouse served as a builders marker for the original lighthouse? The next step of the journey begins and ends with an aerial photograph taken of the Frank’s Island Lighthouse in 1995. By 2002, the ruins of the Frank’s Island Lighthouse collapsed into Blind Bay – eventually meeting the fate of its predecessor. The lighthouse is now all but forgotten. The construction of the original lighthouse is remembered as a sort of folly; there are no outstanding photographs of either lighthouse; and the only significant remnant that could possibly be tied to both structures collapsed into Blind Bay and is probably covered by several feet of dark mud. But is that the end of the story? Is Thomas Jefferson’s vision of a grand lighthouse at the mouth of the Mighty Mississippi to end with the unheard collapse of a second lighthouse? Or will this marble marker one day be uncovered by a storm and be discovered by some future historian who will carry on its legend and its legacy? It has been said that a photograph is worth a thousand words. In this case, a closer inspection of a photograph of the Frank’s Island Lighthouse taken in 1995 by Bob and Sandra Shanklin yielded a whole new beginning to this journey. It just so happens that the 1995 photograph was taken of the east face of the tower. The picture taken in 1934 by Samuel Wilson, Jr. is also of the east face. The difference between the two photographs is the marker from the earlier picture is missing in the more recent picture! Where could it have gone? Could it be in a museum? Was the marble slab removed by vandals and sold to a private collector? At this point in the journey, the destination became unclear. Fortunately, the journey continued not far from where the last phase ended. Bob Shankin vaguely remembered that a marker from the Frank’s Island Lighthouse was on display at one of the old Civil War forts around New Orleans. As history would have it, New Orleans was heavily fortified at the time of the Civil War by no fewer than eight active fortifications. However, only two of these old forts are open to the public – Fort Pike in New Orleans and Fort Jackson in Buras, Louisiana. Now there is a fork in the road. With these two forts being about 55 miles apart it should not be difficult to get into a car and visit both forts in one day. Up until August 29, 2005, this trip would have been no problem. However, both forts were overwhelmed by the forces of Hurricane Katrina. Fort Pike suffered a direct blow - opening three-foot wide cracks in its walls. Fort Jackson was flooded by Hurricane Katrina and then re-flooded almost one month later by Hurricane Rita. So, no matter which direction is taken, the journey is cut short. Plaquemines Parish was so heavily hit by Hurricane Katrina that only the first few miles of Highway 23 were accessible for weeks. As an outer-lying parish, Plaquemines Parish is having a much more difficult time getting back on its feet. The same is true for Fort Jackson. Whereas Fort Pike is managed by the Louisiana Office of State Parks and is funded by the State, Fort Jackson is managed by the local municipality. This makes funding for restoration efforts more difficult. Despite these difficulties, the people in Plaquemines Parish were very helpful and courteous. The Parish Historian, Rod Lincoln, was very knowledgeable about Frank’s Island Lighthouse and all of the other lighthouses that marked the Passes. Without hesitation, Mr. Lincoln was able to confirm that the marble marker from the Frank’s Island Lighthouse is now on display at Fort Jackson. However, like its sister fort, Fort Jackson is also closed to the public for an indefinite period of time. At this point, the mystery is solved and the story ends. But, as in every good story about a journey, there is a hero. The hero in this story is a Mississippi River boat pilot named Captain Mark Delesdernier, Jr. As a child, Captain Delesdernier had the opportunity to frequent the Frank’s Island Lighthouse – its lantern-less tower now standing in waist-deep water. He was captivated by the marble cornerstone of the lighthouse and read its inscription often. Over time, the mortar around the marker gave way, and the marble slab became loosened from its one-hundred-fifty-year-old resting place. At some point, the bottom right corner of the marker was damaged and a small section broke off. By the late 1960’s, the cornerstone was released from its encasement and it fell into the water. On a warm sunny day, Captain Delesdernier dove into the water and began feeling around for the marker. With luck, he found its resting place at the bottom of the bay! He used a small flatboat and a rigging of pipes and rope, positioned through the doorway of the old lighthouse ruins, to raise the eight-hundred-pound slab of marble from the water. As soon as he got the marker into the boat, the weight of the marble slab caused the boat to sink – requiring Captain Delesdernier to get a bigger boat. Eventually, he donated the cornerstone to the people of Plaquemines Parish. A new resting place was hewn out of the brick interior of Fort Jackson, and the marble marker was re-encased into its new home – once again on display. A metal plaque was then placed over the Frank’s Island Marker by the Plaquemines Parish Commission Council to illustrate the marker’s history and to honor its dedication. Whether or not Captain Delesdernier truly knew the history behind the lighthouse and the marker, he is a hero for saving this piece of history before it was lost to the muddy waters of Blind Bay and forgotten. At the end of every journey, one should reflect and take the time to look at the pictures. In this journey, there are a few things to ponder. The journey began with President Thomas Jefferson when he ordered that a monumental lighthouse was to be erected. It then went to Benjamin Henry Latrobe and a grand lighthouse was designed. Next it fell into the hands of Winslow Lewis. An exquisite lighthouse was built, only to be torn down almost immediately due to a failure of its foundation. At this point, did Winslow Lewis recover the builders marker from the first lighthouse and save it for a future replacement? One only has to look at Samuel Wilson’s photographs of the Frank’s Island Lighthouse to realize the answer. There is nothing elaborate about the second lighthouse built in 1823 with the exception of the marble marker. Lewis made only one commitment to Congress in regards to the second lighthouse – that he would guarantee its foundation. Unlike his predecessor, Benjamin Latrobe, Lewis was not hired to design a monument. He just had to build the 1823 lighthouse so that it would not collapse. To have such a large piece of marble cut and shipped from the East Coast would have been an unnecessary expense for Lewis. 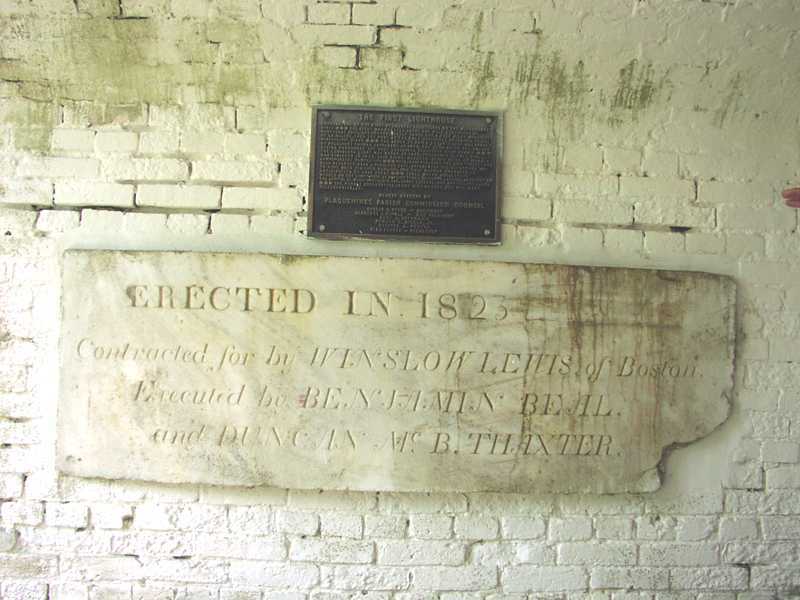 Therefore, it is probable that this marker is the only remaining identifiable object to have served as part of the structure for the Lighthouse at the Mouth of the Mississippi River as ordered by President Thomas Jefferson. Incidentally, Fort Jackson was erected around the same time as the lighthouses at Frank’s Island were being constructed. It is somewhat ironic that a fortification built to guard the first Capitol of the Louisiana Territory now stands to shelter a piece of a lighthouse that once guided sailing vessels safely to the mighty river that runs through it – two remnants of Thomas Jefferson’s legacy, living in the past, huddling together as though waiting out another storm. There is an underlying tone contained within this blog that demonstrates a lack of faith in the design, engineering, and construction abilities of Winslow Lewis. Even researchers who feel Lewis was “the right man at the right time”, such as Richard W. Updike, make these assertions with a certain lack of conviction. No matter what opinion one may have of Winslow Lewis, he did accomplish what was thought to be impossible… He was able construct a stable masonry lighthouse structure on the soft soil of the Mississippi River Delta. What makes this achievement more impressive is the fact that he went before Congress and guaranteed that he could do so despite Latrobe’s apparent failure to achieve the same. As a further credit to Lewis in these endeavors, he was able to repeat his success; but not without some failures in between. The 1823 Frank’s Island Lighthouse stood for 179 years before it collapsed. It had sunken about 3 to 4 feet at the time it was surveyed by Samuel Wilson, Jr.; but it served its purpose without failure or disappointment until it was discontinued in 1856. Between 1831 and 1840, Lewis constructed several other lighthouses on the Mississippi River Delta. These challenges were met with very limited success. Towers at the South and Southwest Passes were undermined by water currents and collapsed. 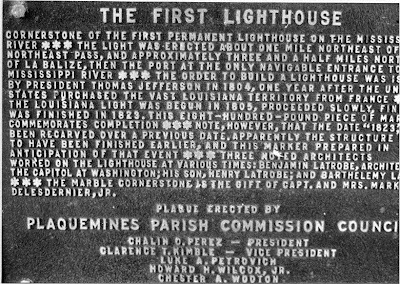 The only other success Lewis had with constructing a masonry lighthouse on the Mississippi Delta is the 1840 Southwest Pass Lighthouse. Even though the tower of this lighthouse was 10 feet shorter than that of the Frank’s Island Lighthouse, the second Southwest Pass Lighthouse began to list shortly after construction. Despite this flaw and a rather disappointing service record, the structure is still standing after 169 years. "In 1842, a Congressman charged that the first tower was shoddily built 'on a foundation of old flatboat planks at a cost of $10,011.74' The construction contract had called for a foundation of pilings driven 40 feet, or as far as a 1,400-pound weight falling 26 feet could pound them." What are you supposed to do if you are walking on the surface of a frozen pond and the ice begins to crack under your feet? You are supposed to lie down and spread your weight across as much of the ice’s surface as you can. By lying down on the ice, do you weigh less? No, you weigh the same; but by lying down, your weight is no longer concentrated within the area of your feet. Instead, it is spread across the entire area of your body. By spreading your weight, you are exerting less pressure across the overall surface of the ice. This is the same thought process that Benjamin Latrobe used in designing his lighthouse. On page 246 of the article, “Benjamin Latrobe’s Designs for a Lighthouse at the Mouth of the Mississippi River”, Dr. Michael W. Fazio offers an extensive analysis of the efforts Latrobe made to lighten the structure and to spread its weight over as large an area as possible. According to the article (Footnote 68), “The area of a 108-ft. diameter circle is 9156 sq. ft. A reasonable pile-mat bearing capacity for the blue clay soil would be about 1500 pounds per square foot; therefore 9156 sq. ft. times 1500 lbs. per sq. ft. equals 13,734,360 pounds, the allowable load that the pile-mat should have supported… If an average weight for the brick and stone masonry is assumed to be 150 pounds per cubic foot, then the total weight of the lighthouse was 36,000 cu. ft. times 150 lbs. per cu. ft. equals 5,400,000 pounds – well below the allowable load. Ruddock, in his report, said that the tower had a masonry volume of 24,667 cu. ft. and weighed 3,154,625 pounds.” Using Dr. Fazio’s analysis, one can divide the weight of Latrobe’s Lighthouse (3,154,625 pounds) into the load bearing capacity of the soil its weight was spread across (13,734,360 pounds) and conclude that the structure came in at only 23% of the soil’s load bearing capacity. Based on this analysis alone, it should be evident that weight was not cause of the structure’s failure. Now, if one applies the same analysis to Lewis’ lighthouse, a different result comes to light. A truncated cone with a lower diameter of 28 feet, an upper diameter of 22 feet, and a height of 75 feet, has a volume of 37,000 cubic feet. Wilson's survey drawing indicates that Lewis' tower had two 18-inch thick brick walls, one inside the other with a 1-foot space in between. My conservative approximation would suggest that the tower was 25% solid, yielding a masonry volume of 9,250 cubic feet. The masonry weight of the tower would be approximately 1,387,500 pounds. Although the base of the lighthouse was 28 feet in diameter, let's assume that it sat on a foundation platform that measured 30 feet in diameter – less than 1/3rd. the diameter of Latrobe’s structure. This would yield a base surface area of 707 square feet, resulting load bearing capacity of 1,060,500 pounds. If my calculations are even remotely correct, then Lewis' tower weighed 327,000 pounds or 31% over the load capacity of the strata it sat upon! Even though Lewis’s lighthouse weighed about 1/3rd. less than Latrobe’s lighthouse, its weight was spread over a much smaller surface area. Perhaps this is why the structure had sunken 3 to 4 feet over the course of 111 years. However, if weight was the key flaw in Latrobe’s design, then Lewis’ lighthouse should have met a similar fate in as short a time. Instead, his tower, which exceeded the load bearing capacity of the soil it sat upon by 31%, continued to stand for 179 years. 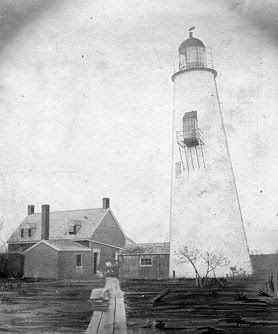 Winslow Lewis, through the success of his 1823 lighthouse, proved that it was not the weight of Latrobe's lighthouse which caused its untimely failure! LIGHT-HOUSE AT THE MOUTH OF THE MISSISSIPPI. The contractor to build a light-house at the mouth of the Mississippi is not answerable for the failure of the foundation unless the choice of the same were left to himself. Sir: If the undertaker to build a light-house at the mouth of the Mississippi had contracted to build a house of particular dimensions, the choice of the foundation being left to himself, he would have been bound to have made a sufficient foundation to support the building, and would have been answerable in damages if it had failed. But, inasmuch as in the contract with Winslow Lewis the United States specify the particular foundation which they will have, I am of the opinion that, if the contractor complied faithfully with this specification in laying the foundation, he is not answerable for its failure. In this case, if either party is to be considered the insurer of the foundation, it is the party who made the selection – to wit, the United States; and the undertaker would, I think, in a suit against him, be permitted to retain so much of the advance as would cover the cost of the materials and labor furnished by him towards the work, so far as it went. If, on the contrary, the foundation was not that for which the United States stipulated, then the undertaker is answerable on this bond, and would be forced not merely to refund the advance which he received, but to answer in damages for the breach of his undertaking. In this opinion, the Honorable William Wirt clearly leans towards the United States (and in de facto, Benjamin Henry Latrobe) as being to blame for the foundation’s failure since the specifications for the foundation were clearly defined within the contract. However, Mr. Wirt allows for a caveat that could totally overturn his opinion. If it were proven that Winslow Lewis and his sub-contractors did not follow the specifications as defined, then Winslow Lewis would be held responsible for the structure’s failure. It would appear that such evidence was never produced… Or was it??? "[O]n breaking up the brick floor of the portico, I found a layer of mud, two feet thick all under the area of the same, and within the wall of the foundation, and it was evidently thrown in, by the workmen, for the purpose of saving about 59,000 bricks which by the contract should occupy the place which the mud does – under this mud, I found a layer of one foot thick, of stones and sand and some oyster shells – I thus came to the planking on the top of the timbers; and found nothing but soft mud and water, among the heads of the piles; although the contract said, the heads of the piles, among the timbers should be filled with shells or solid materials, - yet none were to be found here; I then thrust a pole two inches in diameter, down among the pilings, ten feet deep with the greatest of ease; and drew the same out again – this was done in the presence of several gentlemen who stood by and saw the whole; the water immediately rose to within two inches, of the top of the ground, being 4 feet above high water. Therefore to ascertain whether this water came from below the foundation, or whether it was lodged there by rains; I excavated a hole two feet square and 6 feet deep, in the virgin strata, at about 8 inches on the outside from where the pilings were driven – and at that depth I found no water; what I dug out, was a solid blue clay strata, that weighed 95 lbs. to the cubic foot….It therefore appears that this water was one cause of the tower sinking – another cause, of the sinking of the building, was, the workman having removed the scaffold poles too soon, before the work had gotten properly dry, and consolidated all together – The falling of the walls of the rooms, and of the parapet, and of the 20 stone pillars; was in consequence of bad work, and bad mortar – the arches were not sprung, in a proper manner; as the walls were carried up too high, before they laid off the arches – the consequence of this was, the walls at the heighth; were not sufficiently solid, and weighty to stand as butments; of the semi-arches, and when the weight of the parapet pressed upon the arches after the poles were removed, the walls split, and gave way, and consequently the whole work fell to the ground." 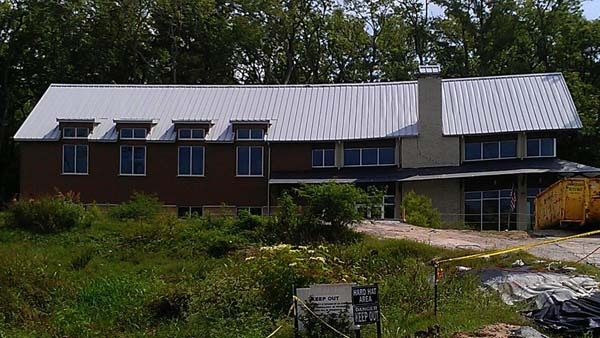 If we accept Mr. Ruddock’s report at face value, it is clear that Latrobe’s design for the foundation was not followed; the keeper’s house and its walls were improperly constructed; and the support scaffolding was removed too quickly. However, it is unclear from Dr. Fazio’s article just who Mr. Ruddock was and why he was qualified to draw such conclusions. A bit of research on my part found within the 1822 edition of Blunt’s American Coast Pilot establishes that Mr. Ruddock was the engineer on board the Aurora Borealis, the lightship stationed at the Northeast Pass while the second lighthouse at Frank’s Island was being constructed. (I have since submitted my findings regarding Mr. Ruddock to the USCG historian since this information also establishes that the Northeast Pass lightship was the first such vessel to be stationed outside of protected waters.) With all this in mind, it would seem that Mr. Ruddock’s report would have historically established Winslow Lewis as the individual responsible for the collapse of the first Frank’s Island Lighthouse. Unfortunately for Latrobe’s legacy, Beverly Chew, the New Orleans Collector of Customs, wrote a letter to Stephen Pleasanton accompanying Mr. Ruddock’s report stating, “that the sinking of the building cannot be attributed to the causes assigned in his report.” It seems as though the now apparent actual history of the Frank’s Island Lighthouse was skewed by Mr. Chew’s not-so-professional (in my estimation) opinion as to the cause of the structure’s failure. I must first take a moment to apologize for not updating this blog for some time. The chronology of topics has finally led me to a discussion of which I have little source material to reference. I had hoped to discover more information about the construction of Latrobe's Lighthouse before I posted this article, but I have had little success in doing so. Since I was not able to discover any new information about the construction of the first lighthouse on Frank's Island, I have decided to approach this topic by establishing an accurate time line of the events that occurred between the purchasing of materials in 1818 and the halting of construction in 1820. According to Samuel Wilson, Jr.'s report for the Historic American Buildings Survey, jurisdiction of Frank's Island was ceded to the United States on March 2, 1818. 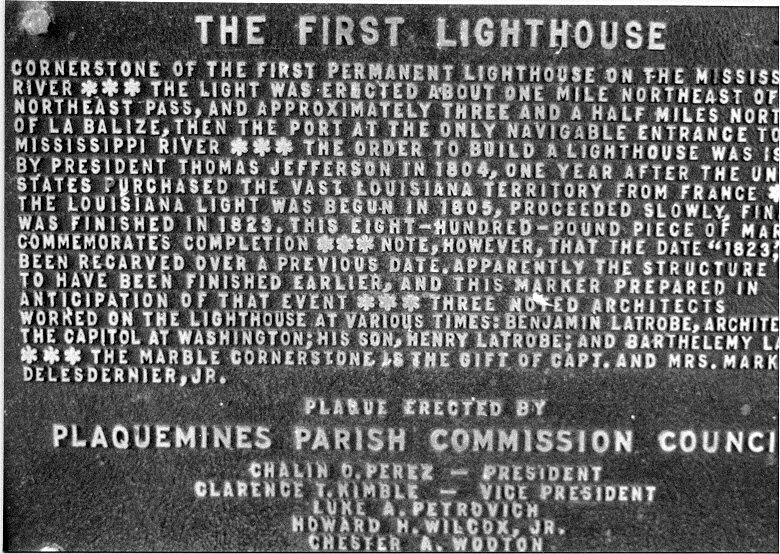 It was then reported in the March 11, 1818 edition of the "Louisiana Courier" that the contract for building the lighthouse had been signed. By April 13, 1818 materials had started arriving by way of the Brig Triton from Boston. The next dated reference I can find is from Dr. Fazio’s report. By July of 1818, Winslow Lewis had sent his agent, Benjamin Beal, to Frank’s Island. Joining him was Captain Edward Gardner, a customs inspector, who drove a test pile and determined there was “no doubt that a permanent building may be erected with perfect safety.” Dr. Fazio’s report then states that Beal went back to Boston to confer with Lewis. During the meeting, Beal conveyed his doubts that the island’s soil could support such a masonry structure. Despite Beal’s misgivings, construction on the lighthouse had begun by January of 1819. In a report written by Benjamin Latrobe dated May 7, 1819, Latrobe describes a personal visit he made to Frank’s Island. In his report, Latrobe conveys his disappointment with the lack of shells and other hard materials that were to be placed among the piles. During this inspection, Latrobe did approve of the building materials (bricks and stone) that had been procured for the lighthouse’s construction. He also found some of the work to be “faithfully executed”, but Dr. Fazio’s report is unclear as to specifically which work Latrobe was referencing. Included in Latrobe’s report is a drawing of the construction site showing the foundation and temporary buildings. Through the research I have located so far, things become unclear at this juncture. According to Dr. Fazio’s report, Latrobe read Mr. Hearsey’s report and met with him to discuss the building’s settling. Based on the information presented to him by Mr. Hearsey and “other evidence”, Latrobe concluded that the settling had stopped and construction continued. On March 14, 1820, The Speaker of the House laid before Congress a report from the Fifth Auditor of the Treasury, Stephen Pleasanton, regarding the progress being made on the lighthouse. Dr. Fazio’s report implies that this report contained the “bad news” of the structure’s failure. This is confirmed in Mr. Wilson’s HABS report which states, “that the building was settling dangerously, large cracks being produced in the walls”. At this point, it appears all construction work on the lighthouse was ceased. According to Dr. Fazio's report, "By early April, the contractor of record, now a man named Duncan Thaxter, had abandoned the island". Several people, including architects and engineers, were called in over the course of the next year to inspect the damage. Eventually, the inspectors deemed the failure of the structure to be too costly to repair. Even before a consensus on the damage was reached, in May of 1820, the Secretary of the Treasury had requested that a “light vessel” be stationed at the mouth of the Mississippi according to “The Public Statues at Large of the United States of America” (Sixteenth Congress, Session 1, page 599). You may have noticed a drawing of the 1823 Frank’s Island Lighthouse towards the top of the main page. 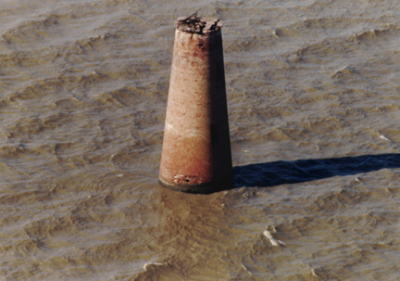 One of the things that first drew me to the Frank’s Island Lighthouse was the aerial photograph of the tower ruins taken in 1995 by Bob and Sandra Shanklin. What intrigued me about the photograph was the fact that the lantern was missing. As I began researching the structure, I discovered that no known drawings or photographs existed which depicted a complete lantern. For the longest time, I questioned whether the original lantern had been reused or whether Lewis’ tower was capped with one of his signature “birdcage” lanterns. The photographs from Samuel Wilson’s 1935 report for the Historic American Buildings Survey show the remains of a railing system consistent with a “birdcage” lantern. A report from the 1855 U. S. Congressional Serial Set states that the “dome” was painted. 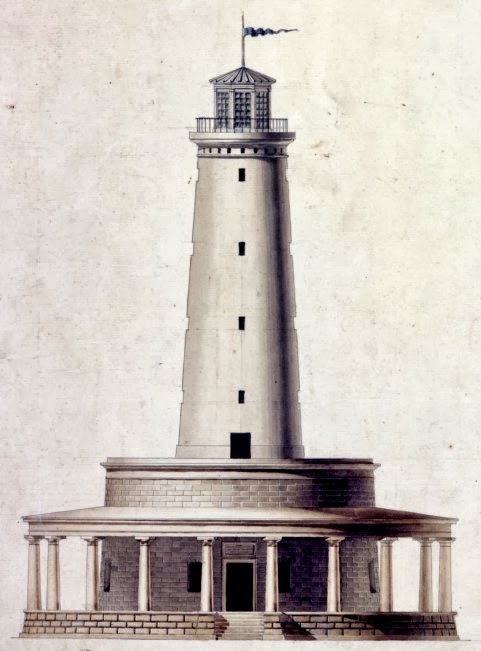 Since the lantern from the first lighthouse was equipped with a stone cap, my conclusion based on these findings is that the 1823 lighthouse erected on Frank’s Island featured a “birdcage” lantern. Once I came to this conclusion, I began searching for a scale drawing of a Lewis “birdcage” lantern. This was more difficult than I originally thought considering it has been noted that Lewis had a canned set of tower designs. I eventually discovered such a plan in David Cipra’s first book, “Lighthouses & Lightships of the Northern Gulf of Mexico” published for the Department of Transportation in 1976. This book is now out-of-print; but if you can locate a copy at a reasonable price, I would recommend purchasing it. There are pictures and information contained in this 62-page publication that were not included in his second book. With scale drawings of both the Lewis’ tower and lantern in hand, I was able to overlay the two images in scale to generate a single image. I then projected the submerged base of the tower from Wilson’s drawing and added the remaining few feet at the bottom. The "Frank’s Island Lighthouse – 1823" drawing towards the top of the blog’s main page is the result. I hope this drawing serves to give future generations a fairly accurate representation of the lighthouse that stood at the Northeast Pass of the Mississippi River for 179 years. In the proposals sometime since published in this paper, for erecting a light-house at the mouth of the Mississippi, the attention of persons disposed to contract for effecting this object was directed to the circumstance of the existence of quarries of free stone at the Havana. We are now favored, from the revenue office, with the following communication, made by a respectable inhabitant of the Philadelphia. Its importance, not merely in respect to this object, but generally to the country on the sea board, is manifest. Geological Memorandum – Building Stone in Florida. The geological base of the whole peninsula of Florida, and contiguous islands, is, what is commonly called, free stone, though it is rather an indurated marble, such as is found at Portland and Bath, England, and in the quarry in which the capitol of Washington is built, from the quarries on the Potomac. At from eight to ten feet below the surface, this stone is found in the peninsula of Florida; the surface, or upper stratum is a vegetable mould, occasionally mixed with a delicate granite sand, and this is rarely more than two feet deep; at the depth there is a stratum of fine granite sand, white and red intermixed with a ferruginious earth, but in a small quantity; this sand rarely exceeds three feet thick, and much resembles the same kind of sand found about six to eight feet under Philadelphia. Below this second stratum of sand, is a fine stratum of whitish clay or marble, which is usually found of from two to three feet thick, and is an admirable article to mix wherever sand protrudes above the vegetable stratum. Immediately below the mar[b]le, is a deep stratum of whitish stone, which appears to be a composition of petrified or decomposed marine shells; this has been as far as penetrated, which has been about 18 to 20 feet deep. This stone is more elevated above the general level in the island of Anastasia, directly opposite the town of St. Augustine. This island is about 25 miles long, and separated from the main land by an arm of the sea, which is called Mantanzas river; the quarry of which the old fortifications and the houses of St. Augustine were built, is open, and directly opposite St. Augustine. The navigation round the island is good – there is only eight feet water on the bar of St. Augustine, though it was formerly as deep as three fathoms on the bar. This free stone may be cut out of the quarry with a carpenter’s hand-saw, as soon as the upper layer is removed, as it is very soft like cheese, in the quarry; but when some time exposed to the air, becomes so hard as to turn the edge of a tempered chissel. It can be carried from the quarry to the vessels with very little difficulty, being close upon the shore. It would be well worth while to procure that stone for all our light-houses. The quality is the same as that of Havana, only reputed to be whiter, and to contain very little iron veins. I had not intended to continue the discussion on this topic since I did not have any new information to provide on the planning for the original lighthouse erected on Frank’s Island. But, oddly enough, just as I had completed my last post, I came across some of the source documentation that I did not have access to prior. What I found was the original report from the 1816 study of the Mississippi Delta performed by Daniel J. Patterson, H. S. Bonneval Latrobe, and P.L. B. Duplessis, Jr. After reading this report, a few things came to light that I had not seen in other writings about the original Frank’s Island Lighthouse. Another observation from the report is that the chosen site for the lighthouse on Frank’s Island had strategic advantages should the structure come under attack. Shoals and other features of the island made a direct advance rather difficult. In 1816, the memories of the War of 1812 and the 1814 Battle of New Orleans were still fresh on the minds of all involved in this project. The threat of attack was very real. A complex fortification system to defend New Orleans was also being planned during this time. Therefore, it can be concluded that a structure which could withstand bombardment and fire would be preferable to one that could not. Although the report does not state the exact reasons, (but a June 15, 1817 letter from Samuel Smith to Daniel J. Patterson, et al might) it does at least show that there was a preference by Washington for a “stone or brick building” instead of a wooden tower. It had been my impression until reading this report that Benjamin Latrobe was so obsessed with constructing a masonry lighthouse on the soft soil of the Mississippi Delta that he overlooked the obvious fallacy of such a structure’s inevitable collapse. The report prepared by Patterson, Latrobe, and Duplessis shows that the use of brick or stone was a preference by consensus. This report also defines the care taken to make sure that Frank’s Island was the proper location for the lighthouse noted by three major factors: visibility, firmness of the ground, and resistance to attack. It is interesting to note that the 1816 plans for the lighthouse now located in the National Archives were apparently submitted along with this report to Samuel Smith, Commissioner of Revenue. Therefore, all three representatives could be credited for creating the final set of plans for the Mississippi River Lighthouse. (See Addendum Below) The planning for a lighthouse at the mouth of the Mississippi River was not an endeavor that Benjamin Latrobe took lightly, nor was it an endeavor that he pursued alone. 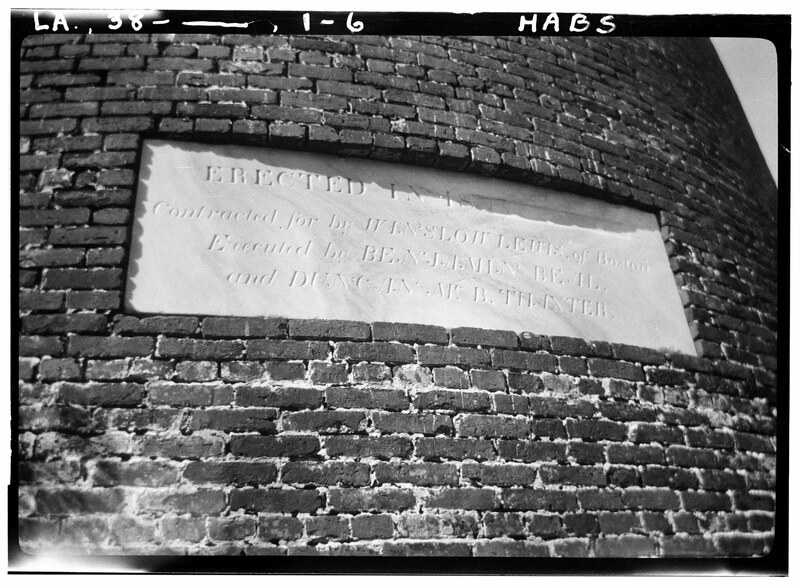 Incidentally, the efforts to fortify New Orleans resulted in numerous masonry fortifications erected on marshy wetlands – many of which are still standing! Addendum (9/16/2009) - It appears as though the plans included with the aforementioned report were not the final set of plans. Instead, what could be considered a preliminary set of plans were submitted. 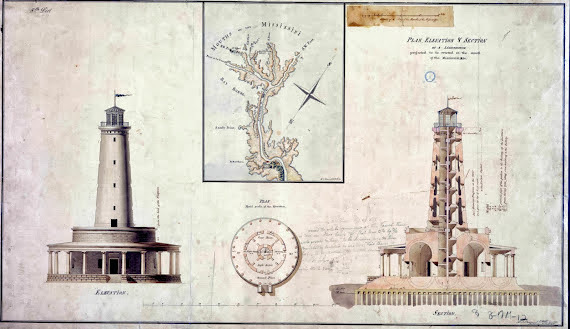 Dr. Fazio speculates these plans represent an earlier design concept that Benjamin Henry Latrobe had envisioned for the Lighthouse at the Mouth of the Mississippi River. After referring back to Dr. Fazio's article, I noted that the final set of plans were sent by Henry Latrobe to his father and were received in June of 1817. Whether or not Patterson and Duplessis had any involment in the development of the final set of plans is uncertain at this point. Below is a copy of Henry Latrobe's 1816 drawing from Cipra's "Lighthouses and Lightships of the Northern Gulf of Mexico". Thomas Jefferson’s vision of a monument to mark the entrance to the Mississippi River was not ill-conceived. The need for a navigational beacon was obviously inherent. There are some issues of practicality regarding the “monument” aspect that have come to light by this day and age; but at the time America was young and little was known about the new Louisiana Territory. 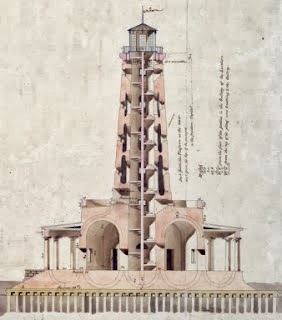 According to “Benjamin Latrobe’s Designs for a Lighthouse at the Mouth of the Mississippi River”, upon being assigned the task to erect such a lighthouse, the Secretary of the Treasury, Albert Gallatin, immediately focused on two critical areas – “visibility and ‘firmness of the ground’”. Barthelemy Lafon proposed a practical and realistic wooden tower made of cypress timber that would have sufficed as a navigational beacon. However, his design for a lighthouse or “phare” fell quite short of being a “monument”. Gallatin then turned to Benjamin Henry Latrobe for assistance in this matter. It is believed that Latrobe studied under John Smeaton, builder of the famous Eddystone Lighthouse. My impression is that Latrobe looked upon Smeaton as a mentor. If it is true that Latrobe studied under Smeaton, therein lies an interesting contrast. Whereas the challenge of the Eddystone Lighthouse was to adhere a masonry structure to a small rock inundated by harsh seas, Latrobe faced an equally difficult but somewhat different challenge – to secure and “float” a masonry structure on an ancient deposit of soft blue clay. Dr. Fazio’s article covers Latrobe’s design process and evolution in detail. For the sake of this discussion, we should concentrate on Latrobe’s final lighthouse design and focus on the foundation, sub-structure, and steps that Latrobe took to reduce the weight of his tower. At this point, I as a blogger have to admit my own limitations… I am not a civil engineer, nor am I a geologist familiar with the alluvium that forms the Mississippi Delta. Therefore, I cannot begin to suggest how accurate De Mun’s conclusions are by today’s science. It would be great if a qualified individual could step in and offer an educated opinion. In 1813, as reported in Dr. Fazio’s article, Frank’s Island was once again selected as the location for the Mississippi River Lighthouse by a group of three representatives, including Latrobe’s son, Henry. This decision appears to have been based mostly upon the accessibility and navigability of the Northeast Pass and not upon the soil conditions of the island. The final documented inspection of Frank’s Island was done by an engineer after the failure of the original structure. His analysis indicated that the “solid blue clay strata” “weighed 95 lbs. to the cubic foot” according to the Fazio article. With a general consensus that the soil of Frank’s Island would support a masonry structure, Latrobe worked on a design that would allow for the weight of the tower to be spread across a much-wider base. His tower and base designs used a series of “inverted arches” to hollow out, and thus lighten the structure as much as possible. Latrobe also specified a unique and integral design for the structure’s foundation using a cypress piling and planking system. One of Latrobe’s greatest concerns was that the U.S. Congress, through its policy of awarding bids to the lowest bidder, would end up hiring a contractor not qualified to execute the lighthouse’s construction in accordance with his design. Therefore, Latrobe drafted the bid with excruciating detail – possibly warding off any prospective bidders. This opened the door for Winslow Lewis to enter the picture. What is most important to note is that Latrobe specifically designed his lighthouse with the soil conditions of Frank’s Island foremost in his mind. One notices, with a simple glance at the drawing of his lighthouse, its uniquely wide base. Despite the failure of the original structure, if there is any evidence to indicate that its builders did not follow Latrobe’s design to the letter, one should at least contemplate the possibility that the Mississippi River Lighthouse would have been a success had it been constructed properly. The United States Coast Guard has updated the information about the Frank's Island Lighthouse on their website. Some of the new information includes a list of lighthouse keepers and a picture of Latrobe's Lighthouse. I would like to sincerely thank the U.S.C.G. Historian's Office for continuing to update their website as they uncover new information about American Lighthouses. When one thinks of buildings designed by Benjamin Henry Latrobe, the thought that comes to mind is “White and Majestic!! !” The original lighthouse erected on Frank’s Island was no exception. Even though the tower was made of brick, according to Samuel Wilson’s report, Latrobe specified that plaster be used to cover the brick. This would have served two purposes. First, it would have smoothed out the surface of the tower. Second, it would have made the tower white in appearance. If you do not believe me, please refer to the picture of the Mississippi River Lighthouse on the main page of this blog. That picture is taken straight from the plans drawn in 1816 by Henry Latrobe. If you look closely at the flag above the lantern gallery, you will notice the color of the flag has a blue tinge. That is not an alteration. The original plans were drawn in color! Depending on the natural shades of the stone used for the cap and the outer walls of the base, these areas may have had a slightly grey color; but the overall appearance would have been white. The plans also show that the height of the lighthouse, measured from the bottom of the base to the top of the cap above the lantern gallery, was ninety-three feet tall. The tower itself was fifty-seven feet tall, measured from the base of the tower to the bottom of the platform. At its base, the tower was twenty-two feet wide; and at the top it was fifteen feet wide. It is important to note these dimensions for comparison to the second lighthouse. Since there are no known drawings or photographs of the second lighthouse erected on Frank's Island depicting it with a complete lantern gallery, one can only speculate about its overall appearance. It has been written in several places that Winslow Lewis designed his tower by closely following Latrobe's design. It has also been stated that Lewis reused the materials from the original structure to build his lighthouse. Based on my research, I would have to mostly disagree with these two assertions. Congress instructed Lewis to reuse as much material as possible from the first lighthouse to build his tower. It is certainly possible that Lewis reused brick and left-over mortar from the original structure; but considering his testimony was that the weight of the original tower caused its failure, I am certain that Lewis was not inclined to reuse all of the original materials, particularly stone, with the exception of the original cornerstone since it bore his name. I am also not inclined to believe that Lewis borrowed heavily from Latrobe’s design. Lewis’ tower was rather simplistic in its design with practically none of the ornamentation and structural engineering that Latrobe incorporated into his design. Congressional Serial Sets from 1850 to 1859 describe Lewis’ tower as being white in color with no day-mark. The top of the lantern gallery has been described as having a “dome”. Based on the pictures included in Wilson’s report, the railing system was typical of a Winslow Lewis “Birdcage” lantern. Therefore, I would suggest that the North East Pass Light-House looked similar to most all of the Lewis’ lighthouses of that era. The closest example I could find (less the wing lights) is the 1840 Southwest Pass Lighthouse as shown on the United States Coast Guard web site. The architectural drawing included in Wilson’s report gives some approximate measurements of Lewis’ tower - estimating its sunken height at seventy-one feet, six-inches tall from water level to the base of the platform. 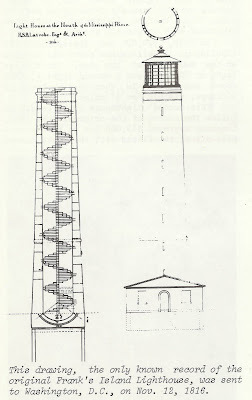 Although historical records vary, Mr. Cipra’s book states that its "fixed light" was elevated "eighty-two feet above sea level.” Based on these facts, one can project Wilson’s scale drawing and estimate that the overall height of the lighthouse was ninety-three feet tall from the base of the tower to the top of the dome. The tower itself was seventy-five feet tall. It measured twenty-eight feet across at its base and twenty-two feet across, just below the platform. Even though the overall height of both lighthouses may have been similar, it is obvious that the two towers had totally different dimensions. In addition, Lewis’ tower had six large windows placed placed asymmetrically. Latrobe’s tower had four smaller windows placed symmetrically on each face. One final note… If my estimations are correct, the second lighthouse had only sunken about three to four feet by the time Samuel Wilson, Jr. surveyed the structure in 1934. Addendum (1/15/2008) - I have added Elevation & Section drawings to the bottom of the main page. In 1805, one of the first Mississippi River lighthouse designs was submitted to Washington by Barthelemy Lafon. He named his proposed tower "Phare du Mississipi" (misspelled in original), which essentially translates to “Mississippi [River] Lighthouse”. In a reference located on page 186 from an 1839 publication called "The Colombian Navigator; or Sailing Directory for the American Coasts and the West-Indies" it contains a brief description of the two lighthouses built on Frank's Island under a footnote titled "Missisipi Lighthouse" (misspelled in original). Once again, I would suggest the word "River" to be implied in the name. In some of the plans submitted to Congress by Benjamin Latrobe and his son, Henry, the structure was referred to as “The Lighthouse to be Erected at the Mouth of the Mississippi River”. In a book titled "The Domestic Architecture of Benjamin Henry Latrobe” by Michael W. Fazio and Professor Patrick A. Snadon, there are named references to the "Mississippi River Lighthouse". This moniker would have been appropriate since there were no other lighthouses being planned for on or near the Mississippi River at the time the first lighthouse was being constructed. The first references I have found for Winslow Lewis’ lighthouse erected in 1823 refer to the tower as "North East Pass Light", “North East Pass Light-House”, or “North East Pass Light Station”. This naming is, for the most-part, consistent through 1859 as found in naval journals, Congressional Serial Sets, and excerpts from periodicals of the day. One reference in the 1858 edition of "The Merchants' Magazine and Commercial Review" refers to the tower as the “North East Pass Day Beacon” - confirming that the lantern had been extinguished in 1856. As far as I can tell, Samuel Wilson, Jr., by way of his HABS report, was the first person (at least in written form) to have referred to the “Frank’s Island Lighthouse” as it is known today. This is, of course, speculation on my part, and is certainly up for debate. I have also seen references to "Frank's Island Light", "Franks Island Light" or "Franks Island Lighthouse". The last two references are missing the apostrophe; but the proper name of the island, according to historical records, is Frank's Island. One good way to get this blog going is for me to post a bibliography. That way we can all be on the same page regarding the history of the Frank’s Island lighthouses. 1. “Benjamin Latrobe’s Designs for a Lighthouse at the Mouth of the Mississippi River” by Professor Michael W. Fazio of Mississippi State University is perhaps the most comprehensive and best researched document I have found regarding the original lighthouse erected on Frank’s Island. This article is written from the perspective of historical architecture; but it covers the planning, construction, and failure of Latrobe’s lighthouse. One of the most revealing pieces that Dr. Fazio uncovers in his research is a written report from a man simply known as “Mr. Ruddock” from “Carolina”. This report makes a very compelling case that the builders failed to adhere to Latrobe’s design – thus casting doubt on the popular belief that the original lighthouse was a failure from the start. Dr. Fazio’s article can be downloaded from JSTOR, which is accessible through many university libraries. Here is the article citation – JSAH XLVIII:232-247, September 1989. 2. The report on the Frank’s Island Lighthouse, prepared by Samuel Wilson, Jr. for the Historic American Buildings Survey, is another valuable resource for the history of these lighthouses. It is most probably one of the first written studies about this subject. To me, the pictures taken in 1934 of the ruins of the second tower are most intriguing. Mr. Wilson also includes an architectural drawing of the tower as it stood at that time. His report can be downloaded from the Library of Congress website - just do a search on "Frank's Island Lighthouse". 3. "Lighthouses, Lightships, and the Gulf of Mexico" is a book written by David L. Cipra. Mr. Cipra has been remembered as being one of the most knowledgeable people on Gulf Coast lighthouses. His book is well-researched and very informative. It is available for purchase online from Cypress Communications. Mr. Cipra also wrote a book called "Lighthouses & Lightships of the Northern Gulf of Mexico" for the Department of Transportation in 1976. This book is now out-of-print, but well worth having if you can purchase a used copy at a resonable price. 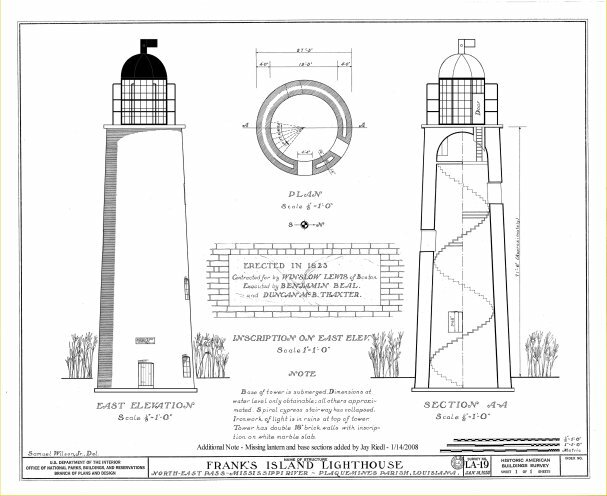 RG 26 ~ Records of the United States Coast Guard ~ Louisiana ~ Mississippi River: Title: "Plan Elevation 1/2 Section of a Lighthouse to be Erected at the Mouth of the Mississippi River." Date: 1816. Size: 15 inches by 24 inches. Manuscript. A copy of this document can be purchased through National Air Survey/Visual Image Presentations. They really went out of their way to provide me with a great copy of Latrobe's plans! I would highly recommend their services for National Archive reproductions. 6. There are numerous "Letters from Lighthouse Superintendents" (Chew to Smith, Chew to Pleasanton) kept at the National Archives dated from 1818 to 1823 referenced in the other recommended reading materials. Unfortunately, I am not able to get to the National Archives at this time in order to copy these letters. If anyone has access to these letters and is willing to share, please let me know by way of a post. It may seem strange to create a blog about a two-hundred-year-old lighthouse that no longer exists. Having grown up in South Louisiana and attending elementary school at Promised Land Academy in Plaquemines Parish, about sixty miles north of Blind Bay, I was surprised to discover the history of the lighthouses erected on Frank’s Island. My quest for information about the Frank’s Island Lighthouse began as an endeavor to know more about early Louisiana lighthouses. The only pictures I could find of the Frank's Island Lighthouse were either early crude drawings, or photographs that showed the tower in ruins. What little history I was able to read about Frank’s Island indicated there were two lighthouses erected on the island – one that collapsed almost as soon as it was built, and one that stood for one-hundred seventy-nine years. As I delved deeper into the history of the Frank’s Island lighthouses, questions began to form. In my endeavor to answer these questions, I discovered that a lot of the information I had read before was not consistent with the source documentation stored at the National Archives. The story behind the original lighthouse erected at Frank’s Island is complex and intriguing. It tells a tale of engineering and folly, of competence and craftiness, of hard work and deception. It is a story in which the nice guy did not finish last... In fact, he did not finish at all. Instead, another surfaced to become the Premier Builder of American Lighthouses. The purpose of this blog is to present and discuss the history of the Frank’s Island Lighthouse in a manner consistent with and supported by historical fact. Unfortunately, historical fact on this matter is scarce. Hopefully, a collective effort in locating such facts and presenting them in this forum will yield the true history behind the Frank’s Island Lighthouse. I will do my best to organize the topics in a manner to promote discussion. I will open each topic heading with a brief history of the facts as I know them to be. From there, we can discuss these facts and their impact to the overall story. All I would ask is that we attempt to support our discussion with factual data and provide sources for our facts. I hope this turns out to be an enjoyable and enlightening journey into the past. This site is best viewed at 1680 x 1050 pixel resolution.